Oleic/Linoleic/Linolenic Polyglycerides, Pentaerythrityl Tetraisostearate, Octyldodecanol, Amyris (Amyris Balsamifera) Oil, Aniba Rosaeodora Wood Oil, Ascorbyl Palmitate, Benzoin Siam Absolute, Bois De Rose (Aniba Rosaeodora) Oil, Borage (Borago Officinalis) Seed Oil, Caprylic/Capric Triglyceride, Cedar (Thuja Occidentalis) Leef Oil, Cetearyl Ethylhexanoate, Cherry (Prunus Avium) Pit Oil, Clove (Eugenia Caryophyllus) Oil, Dimethylmethoxy Chromanol, Eucalyptus Globulus Oil, Evening Primrose Oil, Geranium (Geranium Maculatum) Oil, Green Tea (Camellia Sinensis) Oil, Hazelnut (Corylus Americana) Oil, Helianthus Annuus Seed Oil, Jojoba (Simmondsia Chinensis) Oil, Kukui (Aleurites Moluccana) Nut Oil, Lavender (Lavandula Angustifolia) Oil, Lemon (Citrus Medica Limonum) Peel Oil, Lithospermum Officinale Root Extract, Octyldodecyl Myristate, Olive(Olea Europaea) Oil, Orange (Citrus Aurantium Dulcis) Peel Oil, Palmitoyl Tripeptide-38, Panthenyl Triacetate, Petitgrain (Citrus Reticulata) Oil, Portulaca Pilosa Extract, Retinyl Palmitate, Rose Geranium (Pelargonium Roseum) Oil, Rose Hips Seed Oil, Rosemary (Rosmarinus Officinalis) Leaf Oil, Rosmarinus Officinalis Leaf Extract, Salicornia Herbacea Extract, Sorbitan Isostearate, Sucrose Cocoate, Sweet Almond (Prunus Amygdalus Dulcis) Oil, Tocopherol, Tocopheryl Linoleate, Vanilla (Vanilla Planifolia) Oil, Ylang Ylang (Cananga Odorata) Oil. Discover the gold standard for lip treatments. Hourglass No. 28 Lip Oil is an intensive treatment for lips with essential oils, vitamins, and powerful anti-aging actives suspended in a luxurious oil blend. The 24-karat gold-plated tip glides over delicate skin to leave lips soft, smooth, and well-hydrated. Remove the cap and place your index finger on the grooved surface behind the gold tip. Press down to dispense the product. Oh my God! I never thought I'd be raving about a lip treatment oil, but this stuff is so incredibly good! This lip treatment conditions my lips, moisturizes and relieves any chapping I frequently get from being an avid liquid lipstick user. It truly helps boost the moisture levels on my lips, and smoothes the appearance of my fine lip lines. This treatment contains 4 nourishing vitamins: A, B5, C and E and has a 24kt gold-plated tip that really creates such a soothing effect when I apply it. This lip treatment is such a game changer. ...ladies, lads, and all others, this lip treatment oil is lovely, true, but not to be bought if you can't afford it, imo. It works, it has a lovely aromatic scent, the dispenser looks cool and does its job, but the price is too high. You can get the same results with cheaper products. Also, notice the amount of product you get for the price. Even if you can afford the product with ease, the waste created by the packaging compared to the amount of product... No. P.s. 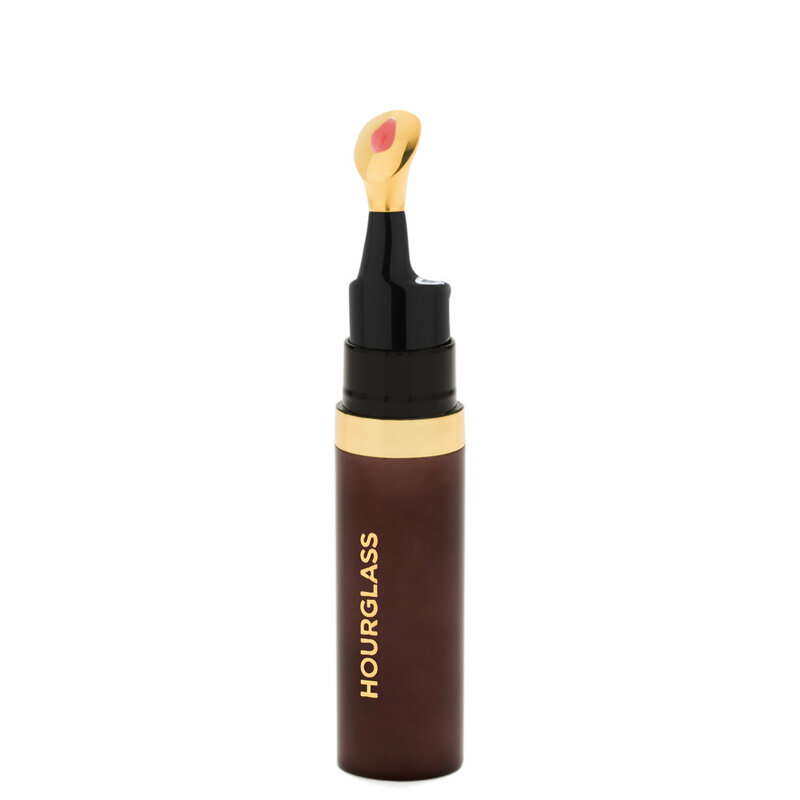 For those of you still thinking about buying a high-end lip treatment: Compared to another wayyyy too expensive lip balm, by Terry's Baume de Rose, the Hourglass one has a lot better results. A beautiful and unique product! Saw this product used on Instagram and ordered to try! It exceeds all expectations for me, it's lush, has an addictive scent ,and makes my lips look plump and fresh! I'm almost 65 and have tried MANY products over the years but this one is truly a winner if you want youthful and really conditioned lips with a gorgeous glow that lasts! NO settling or smearing, it stays where you put it. Will be ordering again for sure!